Book reviews: "The Minotaur" and "Defcon One"
Action, and plenty of it. That's what the reader wants from a techno-thriller. Both "The Minotaur," by veteran author Stephen Coonts, and "Defcon One," by newcomer Joe Weber, serve up the action in heaping ladles. There are enough Stealth planes, Star Wars contraptions and plain old-fashioned shootouts in these two novels to keep even the most ardent closet mercenary in hog heaven for a week. But whereas Coonts' action is woven into a plausible storyline, Weber's plot seems to exist more as an excuse for another dogfight or sub chase. 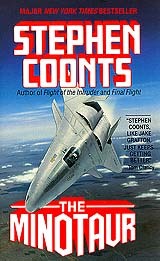 In "The Minotaur," Coonts brings back Navy fighter pilot Jake Grafton (star of Coonts' previous two best-sellers, "Flight of the Intruder" and "Final Flight"), recently assigned to the Pentagon. Grafton's new job is to test the Air Force's two Stealth fighter prototypes to see which would best adapt to the Navy's use  i.e., landing on an aircraft carrier. Along the way, we learn that somewhere in the federal bureaucracy the Soviet Union has a high-level mole who is feeding the Kremlin our latest technological secrets. Grafton is joined by Toad Tarkington, his former navigator, as he tries to fight the Russian spy and a Congress that doesn't want to buy any more Stealth planes. Clever twists of plot, especially in the spy end of the storyline, abound, and we don't learn the true identity of the Minotaur (as the mole is known) or the fact that more than one person may be passing secrets, until the final chapters. Coonts' writing is strongest in the areas of plot development and characterization. While "The Minotaur" is still a thriller, the action is either non-violent (but featuring spectacular high-performance flying) or non-military shootouts during the spy scenes. This arrangement is a departure from other techno-thrillers, but Coonts handles the dual storyline well and it keeps the book interesting. One major flaw with "The Minotaur" is the characterization of Rita Moravia, a Navy test pilot and Coonts' token liberated female (all the other women are, as in most techno-thrillers, scenery or baggage). While handling the test pilot chores on the Stealth craft, Moravia stoutly resists Tarkington's clumsy sexual advances through the first quarter of the novel before completely abandoning character and seducing him in the bathroom of an airliner in mid-flight. After that, she joins the other women in the background. The premise of "Defcon One" (which refers to the highest level of military preparedness) is that conservative elements within the Soviet leadership arrange to have Gorbachev killed in a plane crash. These remnants of Brezhnev's regime then grab power, cancel perestroika and begin planning for an all-out nuclear assault on the United States. The new premier has apparently decided that, in order to succeed, he must strike before the United States gets its Star Wars defense system up and running. He has also decided that, in order best to surprise the U.S. president, it would be a good idea to have small skirmishes across the globe, a tactic which lends itself well to setting up action-oriented chapters. It lends itself less well to a logical flow of plot. But there is plenty of action; not since Tom Clancy's "Red Storm Rising" have there been more dogfights, naval engagements or high-level Cabinet meetings. This is definitely low-budget movie material  especially when the president (clearly meant to be Bush, although Vice President Quayle has resigned and been replaced by a token female character) becomes convinced that the United States must launch its own first strike to prevent the Soviets from doing so first. The strike is, of course, averted in a rather pedestrian manner poorly disguised as drama. 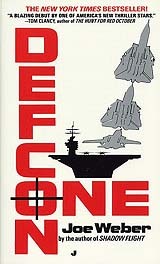 Those dazzled by the latest in military hardware should like "Defcon One": Weber's focus is squarely on the machines. The people manning them, though, have no more character than vanilla pudding. The differences in these two books highlight what it is that makes Coonts successful: His characters (at least the men) seem real. Like an Agatha Christie mystery, "The Minotaur" achieves that rare balance between plot and characterization that keeps the reader hooked from beginning to end.